KEVINMLD: Let’s start with the cover. I have to say I loved the Superman through the ages variants for this book. I think I preferred all of them to the actual Jim Lee cover. 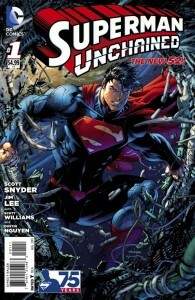 Maybe I’m just a little OCD, but it bugs me that the word “unchained” isn’t in the exact same font as Superman. PTB: “Unchained” in the title at all mystifies me. KEVINMLD: Superman bursting out of chains is a very classic image that gets used over and over throughout his history, but I still would have preferred if they had called it something more traditional like Man of Steel or Man of Tomorrow. PTB: I agree. Superman and chains just aren’t things I’d immediately associate in any way, shape, or form. I get that it might also reference the “real” Superman that Lois’ father has essentially chained up in a bunker, but it’s not great and the book just might be. The logo does nothing to help sell it. I completely agree with you about the variants though. 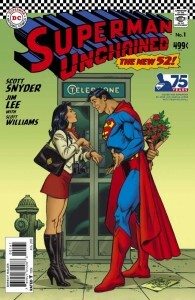 I would have picked up Jose Luis Garcia Lopez’s “Lois and Clark” variant had it been priced closer to $10 than $40. KEVINMLD: I’m a almost a big fan of the 75th Anniversary logo DC is using to promote Superman, but it bugs me that they used the movie logo on the chest of the silhouette and that they seemed to cut off part of the 5. I can’t unsee it and I don’t understand the choice. It’s so close to being awesome, but not quite. PTB: To be fair they cut off part of the 7 too. The numbers overlap and the overlap is blue. It’s a design element that I just don’t get. Just like I don’t get making the anniversary logo look like Superman Blue. I didn’t think anybody liked that guy. KEVINMLD: I was a little shocked by the opening scene of Superman Unchained. Hiroshima and Nagasaki seem like historical events we shouldn’t be retconning for entertainment purposes. It’d be like if someone made a movie that ended with Hitler getting killed in a movie theater. PTB: I agree with you entirely here. KEVINMLD: I was surprised DC went to all of the trouble of doing the poster of that page of Superman punching his way into the falling space station. It’s not that dynamic of an image. They could have used that space to do something cool with Superman stopping the space station from crashing showing the scope of the station’s size. Seems like this gimmick was kind of a waste and definitely not worth the extra $1. PTB: I actually never even opened up the poster in book because I didn’t think I could unfold it without ripping it. Granted I didn’t try all that hard since I’d bought the combo pack and figured I’d see it in the digital version. As it stands, I still haven’t seen it, but using the large format to show an image that benefitted from it would have been nice. PTB: Lex was a bright spot in this issue. If he continues to be written like he was here I’ll have no complaints, even though I’ve had my fill of him as the villain. KEVINMLD: I was a bit struck by the continuity references to Clark having quit the Daily Planet. It’s one of those things that I suspect will stick out and date this series when people revisit the book in ten years. PTB: Is that consistent with the current New 52 continuity? I don’t mind it, and if nothing else it’s one more element that makes this unlike just about every other Superman story I’ve seen. KEVINMLD: Yes. I believe he quit as soon as Scott Lobdell took over the main Superman title because he refuses to write the current version of any of DC’s characters and must immediately reimagine them (examples: Superboy, Teen Titans, Red Hood). I was happy to see Jimmy and Lois playing a role in Clark’s personal life. I wasn’t sure that was still the case with Clark being involved in Diana (a.k.a Wonder Woman, as seen in the pages of Justice League). I’m looking forward to more of that. I’ve been think about Jimmy Olsen a lot lately in the context of the Chicago Sun-Times laying off their entire photography staff and training their reporters to use their iPhones to take publishable photographs. Jimmy needs some level of reinvention before he becomes completely anachronistic. Peter Parker was smart to take that teaching job. PTB: That seems like a crazy approach to reporting. Maybe I’m naive, but I just don’t see this list getting much new material from an iPhone or an untrained eye. KEVINMLD: It’s interesting that DC is introducing a Superman who has worked for the American Way or at least American interests for the last 75 years as part of the celebration of Superman’s 75th Anniversary. I’ll be interested to see where it goes. PTB: It seems like a fresh take on things. I’ve never read Red Son, but conceptually it feels like a variation on the theme. KEVINMLD: Exactly. It definitely could play with similar ideas. 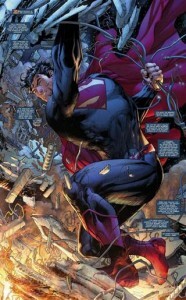 I’m a fan of Jim Lee’s art but I haven’t really loved any of the stories he’s drawn at DC. Hush to me had an obvious ending. For Tomorrow just wasn’t an exciting Superman story. All Star Batman was batshit insane and I was only really a fan of the issue where Robin almost killed Green Lantern. Justice League was dumber than it should have been. So I’d argue this may be the best comic Lee has drawn at DC. PTB: I think that’s a fair assertion, but I’d say it’s more a testament to the good things happening in Superman Unchained #1 than the bad things in those other stories. Scott Snyder has made quite a name for himself with his Batman work, and pairing him with a legendary artist like Jim Lee is a sound move to coincide with Superman’s return to the big screen in Man of Steel and the character’s 75th anniversary. If anyone can do something great with Superman it’s these two and this could be the strongest writer/artist pairing Lee has been part of since joining DC.